Oral submucous fibrosis (or OSF) is a chronic, complex, irreversible, highly potent pre-cancerous condition characterized by juxta-epithelial inflammatory reaction and progressive fibrosis of the submucosal tissues (lamina propria and deeper connective tissues). As the disease progresses, the jaws become rigid to the point that the sufferer is unable to open his mouth. The condition is linked to oral cancers and is associated with areca nut chewing, the main component of betel quid. Areca nut or betel quid chewing, a habit similar to tobacco chewing, is practiced predominately in Southeast Asia and India, dating back thousands of years. In 1952, J. Schwartz coined the term atrophica idiopathica mucosa oris to describe an oral fibrosing disease he discovered in five Indian women from Kenya. S.G. Joshi subsequently coined the termed oral submucous fibrosis (OSF) for the condition in 1953. Group I: Earliest stage without mouth opening limitations with an interincisal distance of greater than 35 mm. Group II: Patients with an interincisal distance of 26-35 mm. 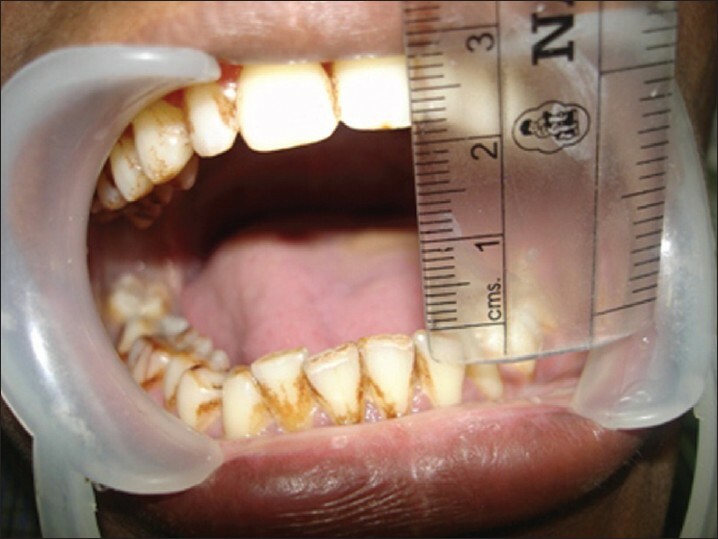 Group III: Moderately advanced cases with an interincisal distance of 15-26 mm. Fibrotic bands are visible at the soft palate, and pterygomandibular raphe and anterior pillars of fauces are present. Group IVA: Trismus is severe, with an interincisal distance of less than 15 mm and extensive fibrosis of all the oral mucosa. Group IVB: Disease is most advanced, with premalignant and malignant changes throughout the mucosa. Chronic exposure to beetel nuts, chilli, pepper and prolonged deficiency of iron and zinc may lead to an alteration in oral mucosa, which causes hypersensitivity to these irritants. This hypersensitivity reaction may often results in a juxta-epithelial inflammation that leads to increased fibroblastic activity resulting in formation of collagen fibres in lamina propria. These collagen fibers are non degradable and the phagocytic activity is minimized. In the initial phase of the disease, the mucosa feels leathery with palpable fibrotic bands. In the advanced stage the oral mucosa loses its resiliency and becomes blanched and stiff. The disease is believed to begin in the posterior part of the oral cavity and gradually spread outward. The incidence of the disease is higher in people from certain parts of the world including South-East Asia, South Africa and Middle East. Pentoxifylline (Trental), a methylxanthine derivative that has vasodilating properties and increases mucosal vascularity, is also recommended as an adjunct therapy in the routine management of oral submucous fibrosis. The treatment of patients with oral submucous fibrosis depends on the degree of clinical involvement. If the disease is detected at a very early stage, cessation of the habit is sufficient. Most patients with oral submucous fibrosis present with moderate-to-severe disease. Moderate-to-severe oral submucous fibrosis is irreversible. Medical treatment is symptomatic and predominantly aimed at improving mouth movements. This entry was posted in Uncategorized and tagged areca nut chewing, atrophica idiopathica mucosa oris, betel quid, lamina propria, marble like appearance, oral cancer, oralsubmucous fibrosis, rigid, tobacco chewing, Trismus on December 21, 2011 by chzechze.